More than 75 easy and ready-to-use games and activities. 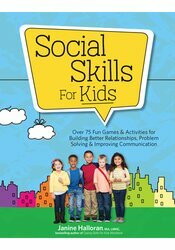 Bestselling author Janine Halloran has created a treasure chest of practical lessons to teach social skills by playing. Halloran shares the best play experiences for kids to learn and practice social skills in real places and situations. This rich resource includes reproducible, step-by-step plans for how to play, alternatives to each activity, and debriefing questions to reinforce learning. Janine Halloran, MA, LMHC, is the author of the bestselling Coping Skills for Kids and has over 15 years of experience working with children and adolescents in schools and outpatient mental health clinics. She founded Encourage Play and Coping Skills to help counselors, teachers, and parents teach kids to deal with big feelings.